Editorial: Is Your Art Good Enough to License? Some of the reasons why artists want to license their art is founded on myths and assumptions. They have heard via the grapeline that they can make good money in licensing their art and they assume that once they start licensing their art they can sit back and relax while the money pours in. As artists that have been in the art licensing industry for years know, creating art that appeals to the consumer to get deals is darn hard work and it takes time. The reason why I am writing this article is that I do not want artists to enter the art licensing industry with misconceptions. Licensing can be rewarding but it can also be challenging and frustrating. Below are my comments on some art licensing myths. Myth #1: License your art so you do not have to work so hard. • "Licensing Art is Hard Work"
• "Art Licensing Tip: What does follow-up really mean?" • "How to Keep Art Fresh & New: Reworking Old Art for Today's Greeting Card Market"
• "How to Keep Art Fresh & New: Continually Evolve Your Work - Part 1"
• "How to Keep Art Fresh & New: Continually Evolve Your Work - Part 2"
Myth #2: License your art if you are broke and need money. It can take a long time to get the first licensing deal (months and sometimes years) and once the contract is signed it can take 18 months or more before an artist gets any money from it. So art licensing is not a quick way to earn revenue. For more information and see an example of the time line from signing a contract to getting paid, read "Licensing Art - Getting Paid Takes a Long Time." There is no guarantee that an artist will be successful in licensing her/his art or even make a living at doing it. Rarely is there an over night success story of an artist licensing her/his art. All the well known artists that license their art have been in the industry for 10 or more years before they became an "overnight sensation." For more information, read "Licensing Art – Can You Make a Living Doing it?" Myth #3: Any art can be licensed. Many artists have created art to sell in galleries, craft and art shows, illustrations for children books, and for handmade and print-on-demand websites like Etsy. They think that a good way to make some extra money is to license their work. However, even though an artist may have a huge portfolio of art it may not be suitable to be put on products. To make the most revenue, the art needs to be licensed to the mass market. Find out the type of art that agent Lance Klass has success in licensing for his agency Porterfield Fine Art Licensing by reading "How to become a Porterfield's artist." And read "Editorial: Not all art is licensable" to find out more about the type of art that is licensable to the mass market. Make sure to read the comments to the article because many licensing experts posted valuable information. Myth #4: One design can be licensed for ALL products. Yes, the advantage in licensing art is that the artist keeps the copyright and then can license it for all kinds of products. However, in reality the art may not be suitable for every product because each manufacturer has their own specifications and needs. For instance, an intricate whimsical pastel colored design for a baby will look well on products strictly for the baby and on gift wraps and other paper products but most likely is not right for decorative flags. Most decorative flag manufacturers want bold and simple designs that "pop." Read "One Painting Can be Licensed for Multiple Products - Right?" Also read articles about several manufacturers and their art needs. Myth #5: An artist will get many licensing deals by signing with an agency. Agencies choose artists to represent who has the art they think is licensable. But that is no guarantee that the agency will be successful in licensing the artist work. Read art licensing agents J'net Smith and Suzanne Cruise comments in "How Long Does it Take to Get a Contract After Hiring an Agent?" Myth #6: Licensing revenue is always from royalties. There are all kinds of licensing deals and payment to the artist can be with a flat fee, by royalty, or payment only IF the product is manufactured (on-demand). To find out more read, "Licensing Art - There is no such thing as a typical deal." 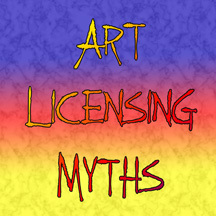 Read "Editorial: Art Licensing Myths continued (myth #7 to #12)" for additional myth comments. Thank you Joan for sharing the reality of licensing. I was in a licensing class once and the instructor said "if you made a six figure salary you had to be really amazing"! Is this a comment you agree with? 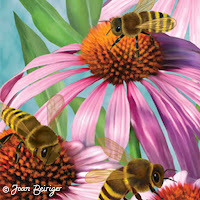 Joan you are amazing!You share so much useful information & still have time to do your own art. I just wanted to say thank you! Your blog has been a great source of information & inspiration! Your blog is by far THE BEST source of information I've ever come across. Thank you so much for your generosity. I'm new to licensing and feel soooo much better having resources like this. Thank you! Very nice blog and informative post.Thank you for sharing. You are sooo right...I've been trying for a long time, it's definately challenging & lots of hard work...but I'm not giving up! Good, strong, informative article, Joan! This will be very helpful in exploding some of the common "everybody knows" myths that so many artists tend to have and to believe, and that lead to unrealistic expectations. Thank you for the great information! I am new to all and everything art related (other than creating it) and it is my biggest wish to get a deal, any deal...anything tangible from something I painted. THANK YOU again!